After winning the 50 thousand dollar jackpot and rushing out of the casino Guy finds himself in a bit of trouble. Sent into a state of limbo, he meets Lady Luck who informs him that the only way to save himself is to play Black Jack; one hand, no questions asked, and no crying." 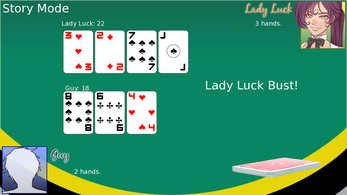 Play the full 52 card deck of Blackjack and beat Lady Lucky. 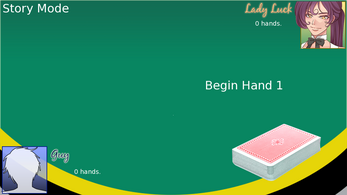 Unlock Free Play mode to allow you to play Blackjack Endlessly. An average playtime of 10 hands of Blackjack. This vn was originally created in 2013. This was the first game that I ever made, and is very short and sweet. 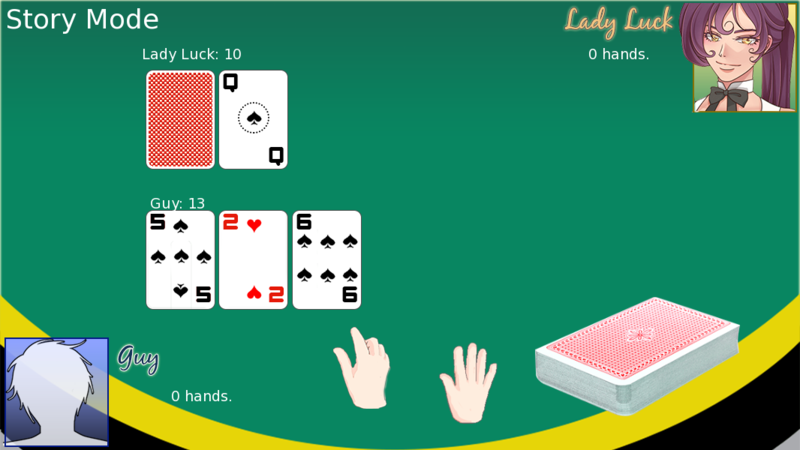 The new version keeps true to the original, but with updates mechanics and a new set of GUI. ^_^ I hope you enjoy!